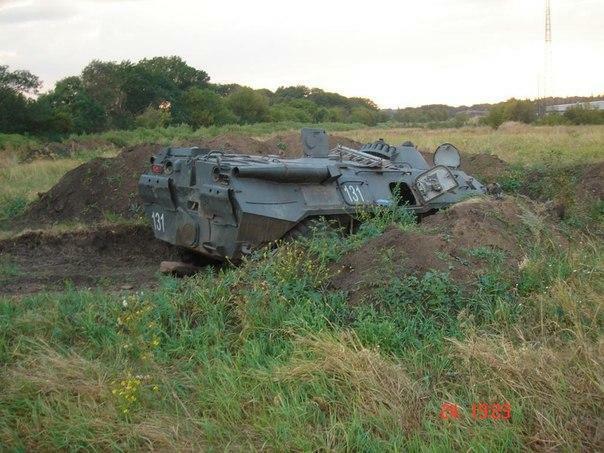 9-09, Destructed Ukrainian Army (UA) armor vehicle BTR-80 nearby Lugansk, captured BTR-80 near Uspenka village. 4-10, Ivano-Frankovsk city. Relatives of UA soldiers are blocking a road. 3-31, A soldier from 30-th Brigade relates of hundreds of UA servicemen died at Saur-Moguila. 2-55, A communication from Paul Gubarev (former Donbass Prime-Minister). A tide of volunteers for Militant Forces has multiplied four-fold. A number of wishing to enter the ranks of Donbass Army enables us to go on with the offensive. Of late, the volunteers expressly “went young”: if earlier an average militant was aged around 40, now a mean age of a DPR recruit varies from 18 to 30. So we do not intend to stop by our successes in the late counteroffensive. We know that there’re going to come Kharkov People’s Republic, Zaporozhskaya, Dnepropetrovskaya, Odesskaya, Hersonskaya, Nikolaevskaya – People’s Republics, because people of Ukraine also want to have people’s government instead of that Junta, which has doomed its people to slaughter. Over last few days we have succeeded in the battle actions in the South-East of Ukraine. 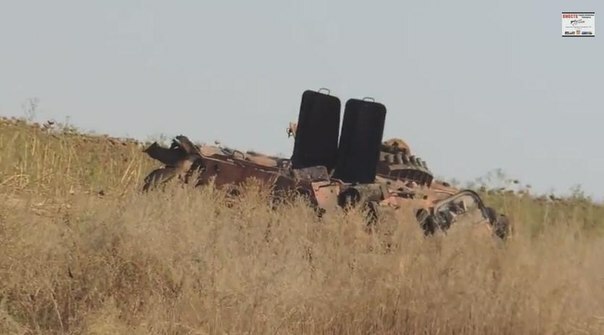 On the weekend we massively counterattacked UA Forces and today our Militant Forces took hold of a strategic point, sort of a symbol, - Saur-Moguila tumulus. 1-56, The President of Ukraine Peter Poroshenko has told that principal theme of negotiations was peaceful solution of situation in the South-East of Ukraine. “Now I can tell that idea of peaceful plan was at last supported by all presidents without exception.” – related Poroshenko to journalists on results of his visit to Minsk, where presidents of Russia, Belorussia and Kazakhstan had met their Ukrainian colleague. 1-52, The President of RF Vladimir Putin, according to results of his negotiations with Ukrainian President Peter Poroshenko, has told to journalists that Russia “will be doing its best for the peaceful process in Ukraine”, but it can’t advance any conditions, since it does not take part in the intrinsic conflict of that country. 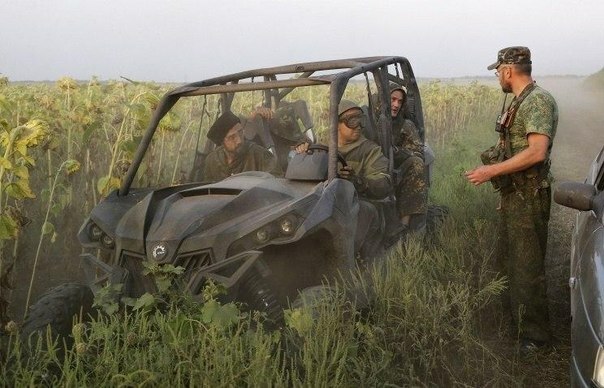 1-44, French volunteers took part of Donbass Army. 0-54, The President of Russia press-secretary Dmitry Peskov communicated that two-sided meeting of Vladimir Putin and Peter Poroshenko had been completed. The talks of the two leaders continued for two hours. After the Summit in format CU-EU-Ukraine leaders of RF and Ukraine agreed upon meeting tête-a-tête to discuss burning questions. 23-36, Vladimir Putin at the Summit of Customs Union with President of Ukraine and European Union leaders. 20-24, The UA troops blocked in Pockets are told that they have until evening. Then massive assaults begin. In Lugansk National Guard fired at the people standing in line to get the Humanitarian aid. Nobody killed, but distribution of vital items was suspended. 19-36, Number of victims in armed conflict of Eastern Ukraine, according to UNO, amounts to 2249 killed and 6033 wounded. 19-16, Photo, graced by Militants. 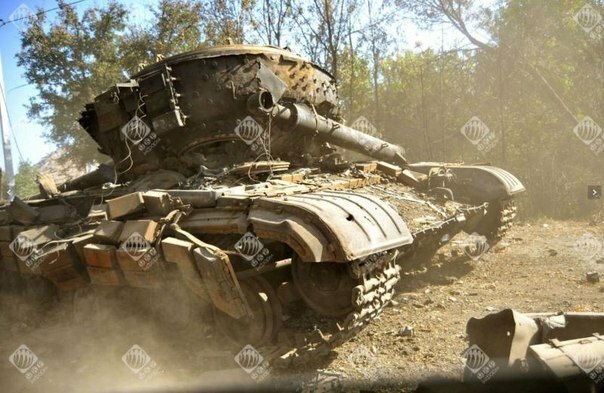 Army of Novorossia is heading south and crushes Ukrainian chasteners. 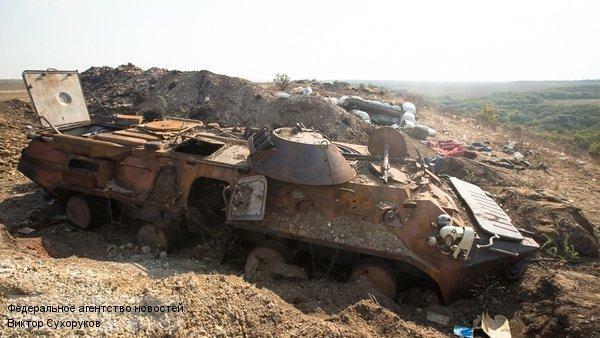 Fresh photos from journalists, accompanying our Army in the offensive. 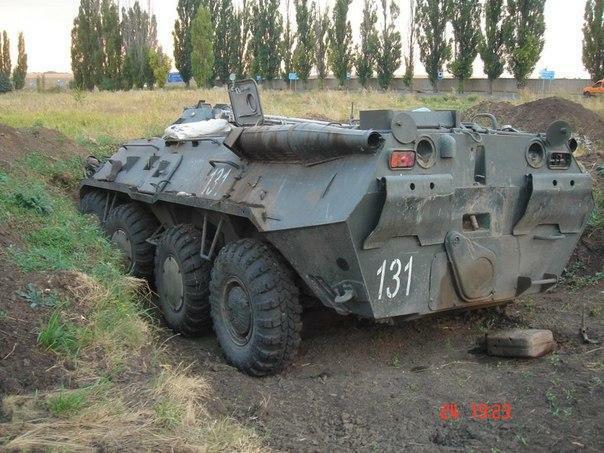 19-12, Ukrainian Government decided on urgent buying out by Ministry of Defense and National Guard of all the produce from the State Military Corporation “Ukroboronprom”. The armor and vehicles are required for “immediate supply of battle action zone” in the East of the country, related local media. 18-37, Locals narrate of Donetsk bombardments. 17-01, Prime-Minister of DPR Alexander Zakharchenko communication. “We no longer agree upon federalization. Donetsk Peoples’ Republic considers only its independence of Ukraine. Now consent to negotiate, - even if it will be granted in Minsk or presently after (and after heavy defeat in the Eastern Front) – is going to change principally nothing. Well, of course the negotiations may start, and even result in a kind of ceasefire, only it will be fragile and unnatural. Novorossia no longer agrees not only on federalization, but on existence of present Ukraine as it is. 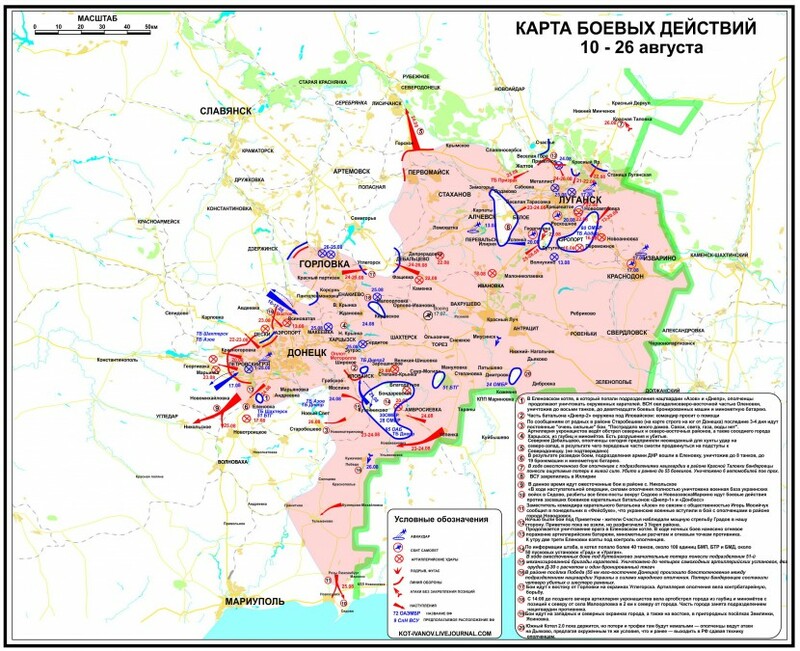 14-49, National Guard retreats in direction of Dnepropetrovsk. “This morning Militant Forces of DPR took hold of a strategically important height Saur-Moguila. Earlier, the height, which in nature is an ancient tumulus, changed hands from militants to chasteners and vice versa. 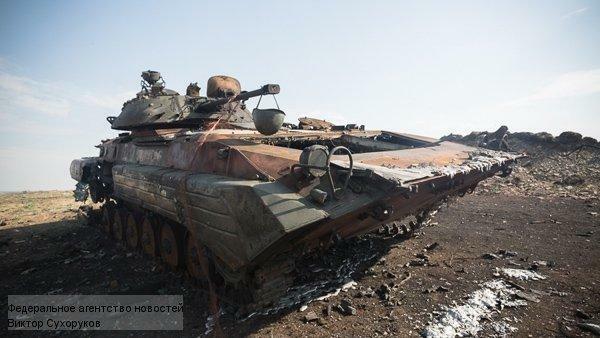 Some time before, from this topmost point of Donetsk region UA troops were able to control Militant Army movements. Overtake of Saur-Moguila may be regarded as a breaking point in this warfare. Now Militant Forces watch UA movements from this height. Actually, this means that our forces achieved one more victory in their strive to lock National Guard in a Pocket. “Novorossia Army offensive is under way. Almost all State Border from Saur-Moguila to Azov Sea is ours. 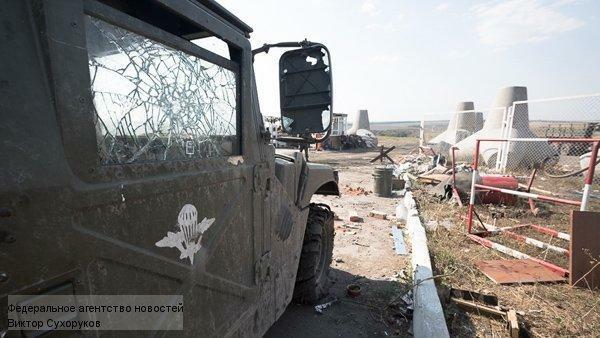 In the course of offensive operations Militant Forces completely destroyed UA military base in Sedovo settlement, block posts around Sedovo and Novoazovsk have been successfully assaulted. Ukrainian block posts are annihilated. Thank you for English version. It's hard to find what's actually happening in Western news, only anti-Russian hysteria and propaganda. Please keep it updated. We'll be sharing it all over the world.